Our Terms & Conditions of Sales and Delivery are applicable to all offers and agreements for all products and services that BAS Trucks offers. It is possible to diverge from the Terms & Conditions of Sales and Delivery, but only if we have agreed this in writing. 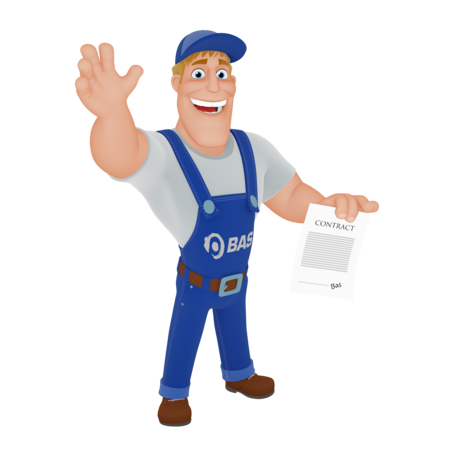 You are doing business with BAS Trucks B.V. We are a subsidiary of BAS Holding and operate under the following trade names: BAS Trucks, BAS Parts, BTS Used, BAS Containers, BAS Vans, BAS Machinery, BAS Tyres. All our quotations and offers are, of course, free of any obligation. We may, however, state an expiry date for some offers. An offer is no longer valid if you have not made use of it before the expiry date. Unless stated otherwise, all amounts stated on our website or elsewhere are in euros, they are net amounts, and they are exclusive of VAT. The prices stated by us are "as is" prices, exclusive of any delivery, document postal costs, or other products and services you require, such as new spare parts, etc. All vehicles are delivered at the location where they are stocked -the vehicle price is based on the assumption that you collect the vehicle at this location. If you want the vehicle to be delivered elsewhere, we may charge extra costs, but only in consultation with you. There is only a valid contract (an agreement or ‘deal’) once we have sent a written confirmation. To make the order definite, you must make a down payment of 10% (or a minimum of € 1,500) per vehicle within two days of entering into the contract. We may also ask you for a confirmation of payment in order to reserve the vehicle for you. If you cannot make the down payment we may terminate the agreement. If you cancel your order, we may keep all, or a part, of your down payment. All invoices must be paid within 21 days of entering into the contract unless we have expressly agreed otherwise in writing. If you do not pay within 21 days of entering into the contract, we may terminate the agreement. If the contract is entered into in a foreign currency and you do not pay on time, we may charge you for exchange rate fluctuations that are negative for us. If this means that the cost deviates more than 5% from the original price, you may cancel the sale without cost and your down payment will be returned to you. Delivery times will be agreed between you and us. Any period of time or date given for delivery is only ever an indication. If the period for delivery is exceeded we will not be liable for any loss. If transport/shipment is a part of the service agreed, we will try to arrange this as soon as possible. We will in all cases arrange transport/shipment within 48 hours of receipt of payment. Your vehicle will only be delivered if you have paid the entire invoice in full. All deliveries will take place at one of our branches. If you do not collect the vehicle in the agreed period of time, we may cancel the order and charge you for any costs. If you inform us at least two days before you intend to collect the vehicle and take possession of your vehicle, we will have enough time to arrange the relevant documents. If the vehicle registration document, or other vehicle documents are not in our possession when the contract is entered into, we will inform you of the date we expect the documents. It is entirely at your own risk if you start making use of the vehicle in the meantime. If we cannot supply the documents to you after all, you may cancel the contract. All vehicles are sold without any form of guarantee in the condition as seen by you on the website or at the sales location. We take the greatest of care when supplying the technical details, history and mileage of vehicles. However, because we are dependent on third parties, you cannot derive any rights from this information. We will do our utmost to ensure that you receive the correct documents from us, but you yourself are responsible for the import and/or registration of your vehicle in the country of destination. You must decide for yourself whether temporary registration plates and insurance, perhaps delivered by third parties, are sufficient for the transport to the country of destination. We will endeavour to advise you as well as possible. If you export the vehicle abroad yourself, you must pay a deposit equivalent to the Dutch VAT on the vehicle. We cannot make exceptions unless specifically agreed otherwise and confirmed in writing. This deposit will be returned to you once the vehicle has been correctly exported and electronically de-registered. Goods bought from us must not be sold on to parties that have been included on EU sanction lists and/or the OFAC Specially Designated Nationals And Blocked Persons List (SDN). In order to provide you with the appropriate level of service, we make your details available to third parties. You will also receive personal offers from us by e-mail. If you do not want to receive such offers, let us know and we will not send them to you anymore. In the event that we are liable for any loss or damage, the liability will only extend as far as immediate loss or damage and never more than the purchase price of the object. All contracts to which the Terms & Conditions of Sales and Delivery wholly or partially apply are subject to Dutch law. In addition to our general terms and conditions, we have a seperate privacy disclaimer to give you better insight in how we take your privacy seriously while giving you the best experience possible using our services. You can read our privacy disclaimer here. You can find the complete version of these terms and conditions here.